If you find the "rules" for hanging wall art and photos confusing, relax. Pictures hung in spots where you can't see them is pretty much the only no-no. Do you need help creating your own unique picture display? The following inspiring examples will motivate you to play with different gallery wall layouts until you find what looks best in your space. Whether you love mixing up your décor on a whim, or you can't commit to a traditional gallery wall, you can't go wrong with a display shelf or picture ledge. Both are perfect for showing off framed images and small objects that you can rearrange or swap out whenever the mood strikes. Want your pictures and art to stand out? Paint your shelf or ledge the same color as your wall. Doing so will make what you display pop. Want to add a shelf or ledge over your sofa? Avoid bonking your noggin by mounting it above seated head height. Here's a nifty tip if you're using brand-new picture frames. You can use the inserts that came with them, as shown here, to map out your perfect layout before hanging. The frames closest to the ceiling create a horizontal line. The ones closest to the floor also line up horizontally. The frames that create the rectangular display's right and left side line up vertically. You can use wall art to carve out a nook in a small space. The framed photos shown here transformed an underutilized corner into a cozy spot for reading and lounging. There's nothing like personalizing your walls with a mix of vintage and contemporary family photos. Eclectic arrangements like the one shown here toss uniformity out of the door with mismatched picture frames and an organic layout. Here are a few good to knows for creating your special family photo wall. To find that perfect arrangement, experiment on the floor first. It's one of the easiest ways to plan a gallery wall layout. Take pictures of your favorite groupings so you can pick the best one when you're ready to hang. Another good tip, keep frames evenly spaced. It will keep your photo display from feeling crowded. How high should you hang your pictures? A good rule of thumb for maximum viewing enjoyment is placing framed images centered at eye level. While eye level varies from person to person, it's usually 55" to 61" up from your floor. If you're hanging a cohesive collection of images that are identical in style and size, a symmetrical layout that uses identical frames, like the display shown here, is a beautiful way to go. Think you can't have a gallery wall behind your TV? Well you can, if you work your flat screen into the arrangement as the display shown here. Got a stack of set boxes like the ones shown here? Don't forget to work them into the arrangement. Decor rebels take note; you don't have to center your wall art or photos over your sofa. This inspiring off-center layout transforms an awkward corner into a beautiful focal point. Arranging your pictures frames around furniture as shown sparks visual interest. Feel free to create a meandering image-scape with artwork hung at different heights. 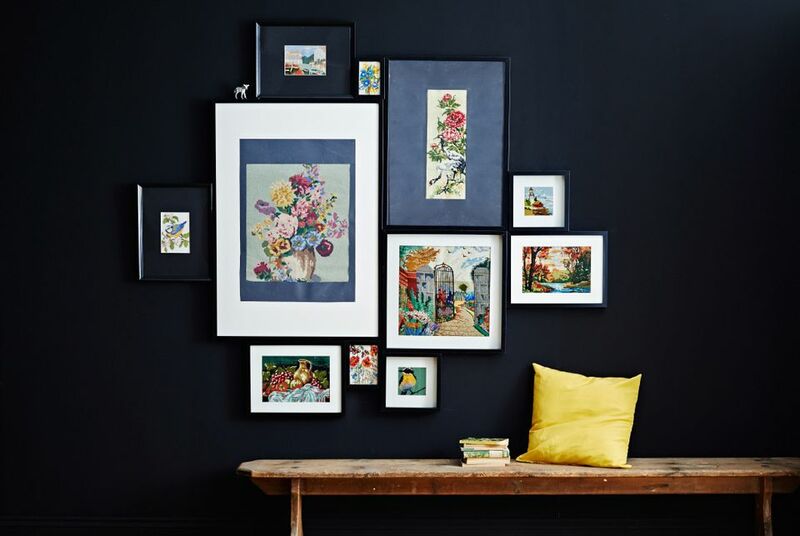 If you love the idea of a gallery wall, but don't have the patience to create one, a collage frame will help you fake it. A good example is the VAXBO by IKEA. It's a prebuilt set of frames for eight images. All you have to do is insert your pictures and hang. Is 500px.com a Good Alternative to Flickr?